RedCape Theatre return with a dark comedy. The tale of Maureen and Sylvie’s Road Trip around the highways and byways of England delivering essential life-saving First Aid training. 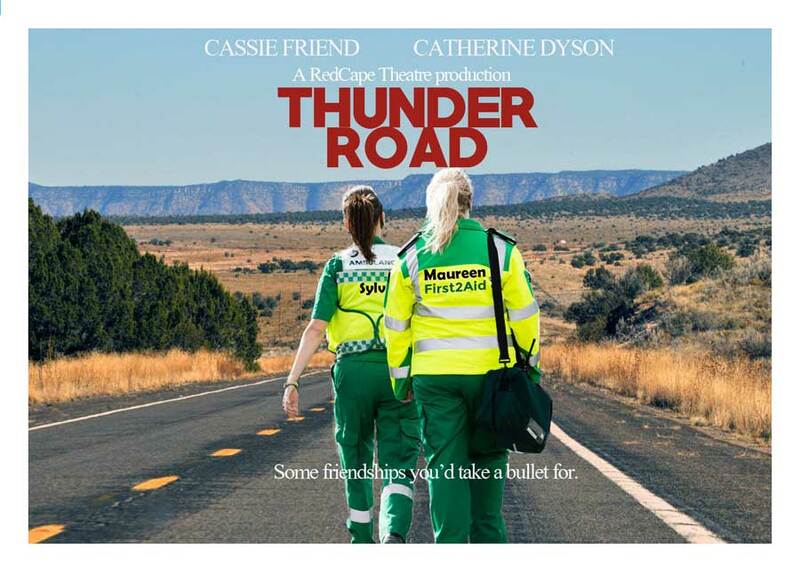 Part quintessentially British First Aid training course, part ' Thelma and Louise', Thunder Road is a show about how to survive. The show has a unique style and tone, a blend of stand-up/compering, physical theatre and new writing. It is highly accessible whilst remaining true to the RedCape mission of telling the stories of ordinary people in extraordinary situations. Thunder Road tells the story of two women, Maureen and Sylvie, who embark on a First Aid training trip. When things take an unexpected turn in a Travelodge, events spin out of control and they find themselves on a life changing road trip where their friendship is tested to its limits and they must keep moving just to stay alive. 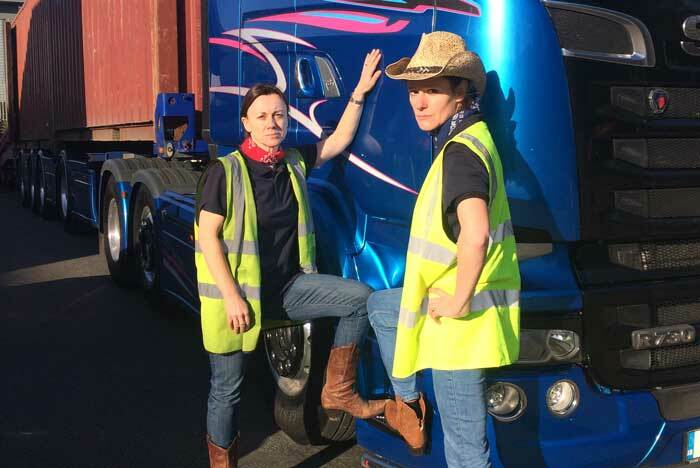 The characters in Thunder Road, Maureen and Sylvie, are influenced by the creations of Victoria Wood, Steve Coogan, Bridget Christie and Julia Davis, and in common with those creations the show examines some of the darker corners of human nature, venturing into seriously dangerous territory where first aid becomes a metaphor for survival. The story confronts themes of domestic abuse, the curbing of female ambition and the portrayal of women in crime dramas as faceless victims. The characters are complex; absurd yet believable. They claim for themselves themes and concepts that are traditionally masculine: the fugitive buddy movie, cars and driving, the music of Bruce Springsteen and being a life-saving hero. CASSIE FRIEND – REDCAPE THEATRE ARTISTIC DIRECTOR/PERFORMER Cassie Friend is a founder member of RedCape Theatre, she devised and performed in The Idiot Colony and 1 Beach Road. She co-directed Be Brave and Leave for the Unknown and will be performing in RedCape’s new show ‘Thunder Road’ opening 2018. After training at Ecole Jaques Lecoq she joined Pig Iron Theatre Company in Philadelphia. With Pig Iron she created six original productions including the award winning Gentlemen Volunteers (Edinburgh Festival) and Shut Eye (Traverse Theatre/Edinburgh Festival) directed by the late Joseph Chaikin (The Open Theatre). Cassie also performed at Edinburgh Festival, Soho Theatre London and New York with The Riot Group in Fringe First Winner Switch Triptych. Other companies she has performed with include Theatre O, Hoipolloi, Blind Summit, angels in the architecture and the Lyric Hammersmith. She is Artist-in-Residence at South Street Arts Centre where she has directed several commissions for their award winning festival Sitelines; Jacksons Corner, The Final Whistle and Kaspar. CATHERINE DYSON – REDCAPE ASSOCIATE DIRECTOR/WRITER & PERFORMER Catherine Dyson is a writer and performer, and is RedCape Associate Artist. This is her third show with RedCape – she was a performer in '1 Beach Road' and writer on 'Be Brave And Leave For The Unknown'. Recent work includes 'Transporter' a solo show for 11+ touring next Spring, and 'In Ruins', a site specific performance in Reading Abbey ruins in collaboration with Cassie. She is based in Wales and has written for Sherman Theatre, National Theatre Wales and BBC Radio Wales. As a performer she has worked with, among others, Chris Goode, National Theatre Scotland and Uninvited Guests. REBECCA LOUKES - REDCAPE THEATRE ARTISTIC DIRECTOR /ARTISTIC CONSULTANT Rebecca Loukes trained in the body awareness practices of Elsa Gindler with Eva Schmale and Charlotte Selver and Asian martial/meditation arts with Phillip Zarrilli. She co-created and co performed The Idiot Colony and worked as Dramaturg on 1 Beach Road. She is currently devising the new show. As well as being a co-founder of RedCape Theatre she is Senior Lecturer in Drama at the University of Exeter and Associate Editor of the Journal of Theatre, Dance and Performer Training. ANDREW DAWSON - SOUND DESIGNER & ARTISTIC CONSULTANT Andrew is a theatrical originator and artist, studying dance with Merce Cunningham, theatre with Phillipe Gaulier, Monika Pagneux, Jacques Lecoq and movement through The Feldenkrais Method. Over the last 30 years he has created numerous stage performances and as Movement director, he has worked at English National Opera, MET Opera NYC and LA Opera. He was a lead puppeteer in the opening ceremony of the London 2012 Olympics. He created ‘Spirit of the Ring’ The whole of Wagner’s Ring Cycle in 30 mins told with his hands. Listen & wonder: A close encounter with the film music of John Williams, is his latest work. TINA BICÂT- DESIGN Tina designs costumes, sets, puppets and objects for contemporary dance, circus, opera, installation, scripted and devised drama, big outdoor community events, intimate naturalistic shows, transformations and tricks. Her designs are often the result of working with the company in rehearsal. She also works with the Drama students of St Mary’s University where she is the design technician. She is an Associate Artist with Ockham’s Razor, won the Critics Circle award for her work with Punchdrunk and has written seven books on various aspects of theatre practice. TURTLE KEY ARTS - PRODUCER Turtle Key Arts produces and devises original, inclusive art to entertain and inspire. We believe that access to the arts helps to improve the quality of life by bringing people together, offering creative opportunities, social inter-action, confidence and self-esteem.